Active learning, an increased focus on clinical examples, updates based on current teaching and research findings, and digital innovations designed to engage and personalize students’ experience make Fundamentals of General, Organic, and Biological Chemistry simply the best choice for students with a future in allied health. With the Eighth Edition, the authors make learning chemistry a more active experience through features designed to get students doing chemistry. Every chapter features Hands on Chemistry sections that deepen students’ understanding of chemistry by having them perform elementary experiments with everyday household items. Group Problemsat the end of every chapter are designed for in-class use and motivate students toward higher level thinking, such as how concepts fit together and how to apply these concepts in a clinical application. All of the chapter openers, including many of the Chemistry in Action boxes and end-of-chapter problems, have been rewritten for a stronger clinical focus that provides more relevance to allied health majors. 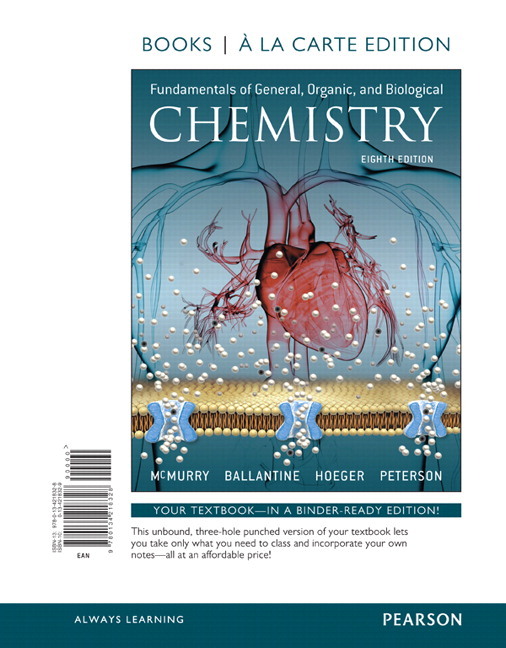 All content has been updated for the modern classroom with special attention to the biochemistry chapters, making the Eighth Edition of Fundamentals of General, Organic and Biological Chemistry the best choice for future allied health students. 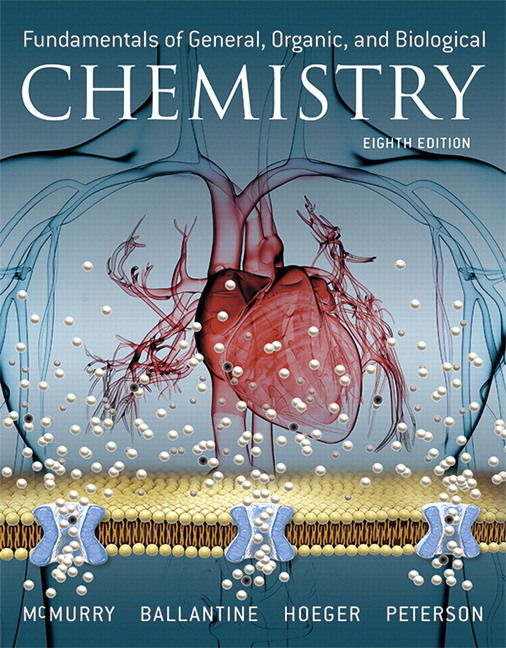 This edition is fully integrated with MasteringChemistry to provide an interactive and engaging experience. Media resources include narrated Video Tutor Solutions for every book chapter that present how to work the most challenging problems and feature additional feedback and instruction from contributor Sara Madsen. NEW in MasteringChemistry is the Chemistry Primer, a diagnostic and remediation tool that provides a pre-built assignment designed to get students up to speed on Chemistry and Math skills at the beginning of the course so they come to class prepared to delve more deeply into topics. MasteringChemistry is the leading online homework, tutorial, and assessment system, designed to improve results by engaging students before, during, and after class with powerful content. Instructors ensure students arrive ready to learn by assigning educationally effective content before class, and they encourage critical thinking and retention with in-class resources such as Learning Catalytics™. Students can further master concepts after class through traditional and adaptive homework assignments that provide hints and answer-specific feedback. The Mastering gradebook records scores for all automatically graded assignments in one place, while diagnostic tools give instructors access to rich data to assess student understanding and misconceptions. Pearson eText is a simple-to-use, mobile-optimized, personalized reading experience available within Mastering Chemistry. It lets students highlight, take notes, and review key vocabulary all in one place — even when offline. Seamlessly integrated videos and other rich media engage students and give them access to the help they need, when they need it. Educators can easily share their own notes with students so they see the connection between their eText and what they learn in class. For instructors not using Mastering, Pearson eText can also be adopted on its own as the main course material. Learn more about Pearson eText or contact your rep for purchase options. NEW! Dynamic Study Modules help students study effectively on their own by continuously assessing their activity and performance in real time. Students complete a subset of questions, indicating their confidence level for each answer. At the end of this and each subsequent subset, students are given explanations for any problems they missed as well as coaching that moves them toward conceptual understanding. This recursive process continues until students answer all questions in the module correctly and confidently. Dynamic Study Modules are available as graded assignments prior to class, and are accessible on smartphones, tablets, and computers. NEW! Video Tutor Solutions in each chapter present a narrated example of how to work the most formidable problems as well as additional instruction from contributor Sara Madsen, who walks students through challenging worked examples and offers them additional guidance on how to approach these demanding problems and concepts. These videos help students approach the most difficult ideas in the course and then test themselves with follow-up problems to assess their understanding. NEW! Concept Map Activities, created from Concept Maps at the end of each chapter, use interactive concept maps and related multiple-choice quiz questions to help students make connections between important concepts within the chapter. 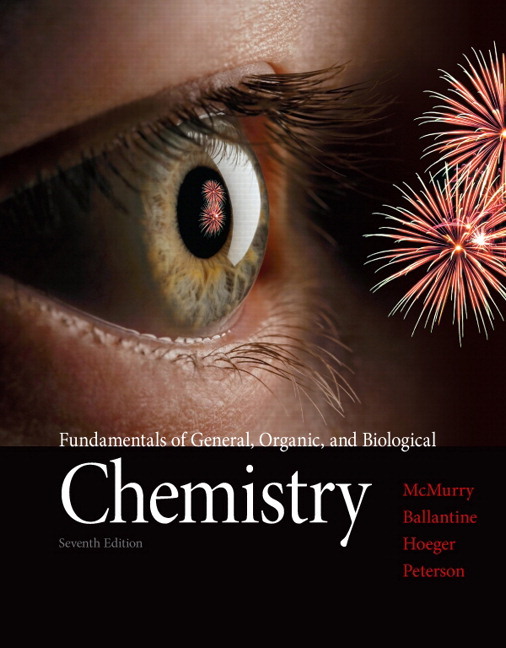 Tutorials specific to General, Organic, and Biological chemistry reinforce connections between general chemistry, organic chemistry, and biochemistry principles while helping students develop their problem-solving skills. Pause and Predict Video Quizzes bring chemistry to life with lab demonstrations illustrating key topics in general, organic, and biological chemistry. Students are asked to predict the outcome of experiments as they watch the videos; a follow-up set of multiple-choice questions challenges students to apply the concepts from the video to related scenarios. Math Remediation links in selected tutorials launch algorithmically generated math exercises that give students unlimited practice on prerequisite skills, freeing up class and office-hour time to focus on the chemistry. Exercises include guided solutions, sample problems, and learning aids for extra help, and offer helpful feedback when students enter incorrect answers. NEW! A strengthened relationship with the MasteringChemistry eText helps students develop topics. NEW! Chapters now have a more focused roadmap that begins with specific learning objectives and ends with a summary study guide that revisits these initial goals and offers students targeted problems designed to help them assess their ability to understand those topics. NEW! Clinical examples provide a stronger clinical focus and more relevance to allied health majors in all of the chapter openers. Many of the Chemistry in Action boxes and end-of-chapter problems have been rewritten to provide a more clinical focus and relevance to allied health majors. Worked Examples offer students critical thinking strategies for problem types presented in the text. These are accompanied by an analysis, which carefully describes the best approach for solving problems of each kind. Ballpark estimates give students a general idea of which relationships are needed to solve the problem when appropriate. This is often compared to the problem solution to show how and why it was a logical estimate. Solutions present the worked out examples using the strategy proposed by the analysis, often followed by a discussion to increase student understanding. Key Concept Problems integrated throughout the chapter and Understanding Key Concepts at the end of each chapter allow students to assess their understanding of the material. Often accompanied by molecular-level art or graphics, they engage students by helping them apply what they’ve learned in each chapter. Comprehensive Problems within each chapter follow worked examples helping students get a better idea of their skill, knowledge and comprehension of important topics throughout the chapter. End of Chapter Problems tie back to chapter goals, allowing students to test their knowledge of emphasized topics. NEW! Group Problems at the end of every chapter are ideally used in class to get students to a higher-level of thinking, such as how concepts fit together, or how to put the concepts they have learned to use in a clinical application. Color-keyed and Labeled Equations draw students’ attention to complicated chemical equations, often glossed over when reading the text, causing them to focus on and understand these fundamental elements. Chemistry in Action boxes extend the discussion of major chapter topics in new ways, providing students with enhanced perspective on core concepts. Mastering Reactions boxes discuss how important organic transformations occur–specifically addition reactions, elimination reactions, and carbonyl additions–allowing students to begin exploring the concept of mechanisms in organic chemistry. NEW! Hands on Chemistry boxes offer students an opportunity to solidify their understanding of chemistry through elementary experiments that can be safely done in their living spaces with household items. Students who learn from kinesthetic activities will benefit from the hands-on aspect of the experiments. Dynamic Study Modules help students study effectively on their own by continuously assessing their activity and performance in real time. Students complete a subset of questions, indicating their confidence level for each answer. At the end of this and each subsequent subset, students are given explanations for any problems they missed as well as coaching that moves them toward conceptual understanding. This recursive process continues until students answer all questions in the module correctly and confidently. Dynamic Study Modules are available as graded assignments prior to class, and are accessible on smartphones, tablets, and computers. Video Tutor Solutions in each chapter present a narrated example of how to work the most challenging problems as well as additional instruction from contributor Sara Madsen, who walks students through challenging worked examples and offers them additional guidance on how to approach these difficult problems and concepts. These videos help students approach the most difficult ideas in the course and then test themselves with follow-up problems to assess their understanding. Concept Map Activities, created from Concept Maps at the end of each chapter, use interactive concept maps and related multiple-choice quiz questions to help students make connections between important concepts within the chapter. Group Problems at the end of every chapter are ideally used in class to get students to a higher-level of thinking, such as how concepts fit together, or how to put the concepts they have learned to use in a clinical application. Hands on Chemistry boxes offer students an opportunity to solidify their understanding of chemistry through elementary experiments that can be safely done in their living spaces with household items. Students who learn from kinesthetic activities will benefit from the hands-on aspect of the experiments. John McMurry, educated at Harvard and Columbia, has taught approximately 17,000 students in general and organic chemistry over a 30-year period. A Professor of Chemistry at Cornell University since 1980, Dr. McMurry previously spent 13 years on the faculty at the University of California at Santa Cruz. David S. Ballantine received his B.S. in Chemistry in 1977 from the College of William and Mary in Williamsburg, VA, and his Ph.D. in Chemistry in 1983 from the University of Maryland at College Park. After several years as a researcher at the Naval Research Labs in Washington, DC, he joined the faculty in the Department of Chemistry and Biochemistry of Northern Illinois University, where he has been a professor since 1989. Carl Hoeger received his B.S. in Chemistry from San Diego State University and his Ph.D. in Organic Chemistry from the University of Wisconsin, Madison in 1983. After a postdoctoral stint at the University of California, Riverside, he joined the Peptide Biology Laboratory at the Salk Institute in 1985 where he ran the NIH Peptide Facility while doing basic research in the development of peptide agonists and antagonists. During this time he also taught general, organic, and biochemistry at San Diego City College, Palomar College, and Miramar College. He joined the teaching faculty at University of California, San Diego in 1998. Dr. Hoeger has been teaching chemistry to undergraduates for over 20 years, where he continues to explore the use of technology in the classroom; his current project involves the use of video podcasts as adjuncts to live lectures. Virginia Peterson received her B.S. in Chemistry in 1967 from the University of Washington in Seattle, and her Ph.D. in Biochemistry in 1980 from the University of Maryland at College Park. Between her undergraduate and graduate years she worked in lipid, diabetes, and heart disease research at Stanford University. Following her Ph.D. she took a position in the Biochemistry Department at the University of Missouri in Columbia and is now Professor Emerita. When she retired in2011 she had been the Director of Undergraduate Advising for the department for 8 years and had taught both senior capstone classes and biochemistry classes for non-science majors. Although retired, Dr. Peterson continues to advise undergraduates and teach classes.